Log into your Google analytics account and select your website profile. Go to standard reporting tab. 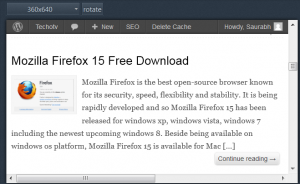 In the left pane, click on Audience – Technology – Browser & OS. You’ll see a list of browsers in the right pane at the bottom. Just above the list, there is a secondary dimension button. Just above this button, there is ‘Primary dimension’ written in small text. Check that line, you’ll see screen resolution link. Did you get it? Don’t worry. I wonder why those crazy people, say Googler, made these useful options’ link so small! 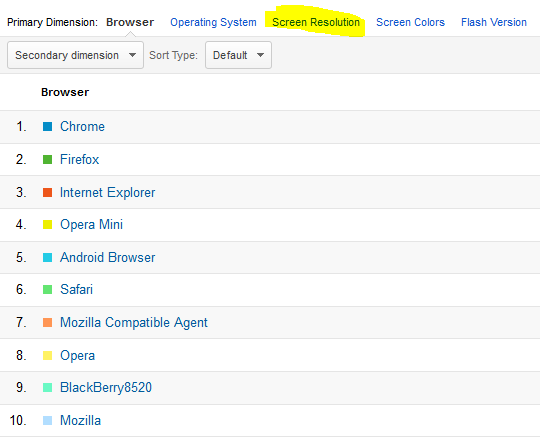 So, on Browser & OS page, just press ctrl+F and type screen resolution in the find box ;) You got it now! A note to website owners and bloggers : Google analytics is really very powerful and if used wisely, it can help you create a better website. So, analyze your reports, every element of reports and use your observation to create a rich experience on your website. Cheers for your targeted conversion and goals !